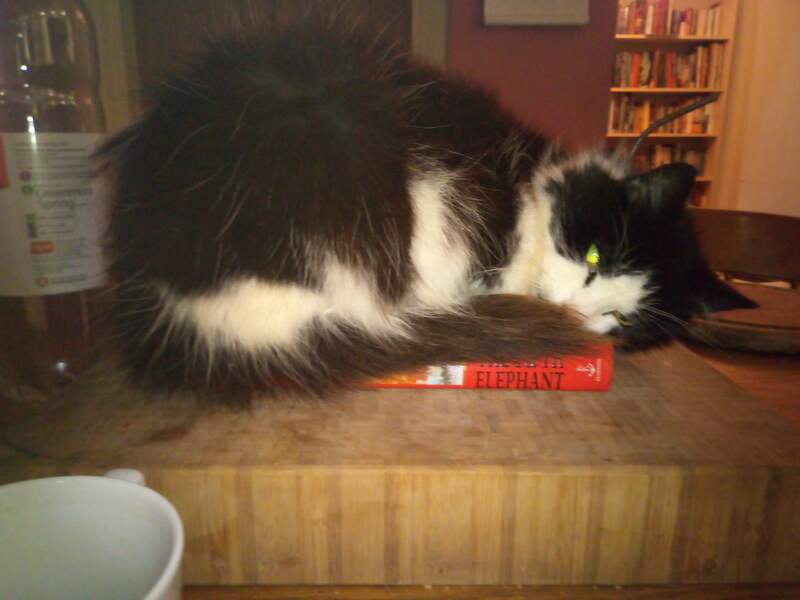 This entry was posted in Cats Sleep on SFF and tagged Nickpheas, Terry Pratchett by Mike Glyer. Bookmark the permalink. It’s cats all the way down. Poor credentials, never get to sleep in peace. Mine sleep all day and wake me up at 5am. Mine have learned that they can’t wake me up in the morning, so have given up. But one of them sometimes steps on my head and looks at my face to see if my eyes are closed. That glowing eye is a warning to not disturb her slumber. Adorable and has good choice in books. So fluffy! I am really tempted to jump into the screen to stroke her! @Mark: My wife and I still haven’t solved the problem of duplicate Pratchetts… Relatives. You need more junior relatives that you can turn on to Pratchett. We have no children, so we sent a box to the oldest offspring of my partner’s siblings last year (after they’d bought a starter house with a little room for books). When we merged our collections, some duplicates got given away, but there’s a bookcase of things we think are worth recommending to other people — it lives, appropriately, in the guest room.